The Daily GRRR! HEADLINES for March 5th, 2015. 1. OCAP Delegation Demands Action for Andy and on SAMS. 2. The Mohawk Council of Kahnawà:ke Concerned Over Bill #C51. 3. Canadian Government Continuing With The Ol’ Divide and Conquer. 4. No New Nuclear Waste Dump in Saskatchewan. 5. Symposium on “Everyday Freedom” From Gendered Violence Hosted In Kitchener. 6. Mexican Authorities Now Disappearing Teachers. 7. Live Long and Prosper - With your Spockified 5$. Welcome, I am your host dan kellar and you are listening to The Daily GRRR! on 100.3fm, CKMS in Waterloo, Ontario. Soundfm.ca on the web, today is March 5th, 2015. Today’s feature is a reading of Peter Gelderloos’s article from counterpunch.org called The Pandora’s Box of Antiterrorism. The piece analyses Spain’s recent crackdown on anarchists and other dissidents under the guise of fighting terrorism. With Harper’s C51 in the works, this read documents a likely future for Canada. 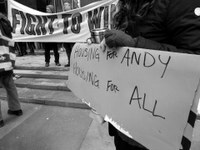 On Wednesday, Toronto’s OCAP sent a delegation to the Ministry of Community and Social Services to demand immediate action to support “Andrew McLean, a 53 year-old man on ODSP with serious health concerns, including an upcoming double bypass surgery, who is facing eviction from his building due to an irreparably broken new computer system for administering OW and ODSP payments.” SAMS or the Social Assistance Management System, is the incompetently programmed/implemented computer system initialised in the fall of 2014 by the Ontario government. 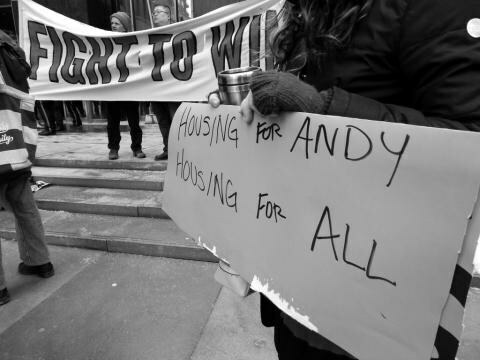 Andrew’s landlord won a LTB hearing which allows him to evict the 53-year old as of March 1st. OCAP notes that the apartment is in a neighbourhood where prices are skyrocketing as a new station for the high speed rail link from the airport to downtown is being completed. All this is ahead of this summer’s 2015 PanAm games. Saying Canada must “avoid the temptation to engage in Big-Brother type methods”, the letter outlines concerns the MCK has with Bill C51 despite agreeing with efforts to “combat true terrorism”. The full letter can be read through the link in this show’s transcript and at kahnawake.com. This letter comes as the CBC reports that ”According to a draft list, committee staff are currently working their way through the names of as many as 70 potential witnesses who could be called to testify over the course of eight sessions allotted to expert testimony, including retired politicians, academics, security experts, First Nations and environmental activists and privacy advocates. Retired Supreme Court justices Louise Arbour and John Major. Former public safety ministers Anne McLellan and Stockwell Day. Maher Arar, Canadian victim of torture at the hands of Syrian authorities and human rights activist. Former associate chief justice of Ontario Dennis O'Connor, who chaired the inquiry into the events that led to Maher Arar being handed over and tortured by Syrian authorities. Mi'kmaq lawyer and professor Pam Palmater and Grand Chief of Union of B.C. Indian Chiefs Stewart Phillip. Greenpeace Canada campaigner Keith Stewart. Fred Pederson from Pinehouse, one of the Indigenous communities whose administration was paid to engage with NWMO in site selection process said “This is what happens when people stick together and fight for what they believe in, against terrorism of our land." One such site is the deep geological repository near Kincardine on Lake Huron which is still inching towards approval despite overwhelming opposition from other communities in the area and around the lakeshore. This victory in Saskatchewan is a reminder that together, we can resist horrible ideas and projects. Not satisfied with only disappearing 43 students from a teachers college in Ayotzinapa in the country’s south last year, reports are emerging that Mexican authorities have disappeared 11 teachers following protests in Acapulco last week, which left one teacher dead. Despite the ongoing violence and corruption plaguing authorities in Mexico, the canadian government insists on keeping the narco-state on its “safe list”. This listing allows Harper’s canadian government to continue deporting migrants back to Mexico, where several have died following their return. Following the death this week of actor Leonard Nimoy, famous for his “Spock” character in the original Star Trek, a fun hobby for some, has become a way to pay tribute to the Vulcan - the Spockification of the 5 dollar bill. You are listening to the The Daily GRRR! Today is March 5th, 2015 and my name is dan kellar and we are now moving into the feature portion of our broadcast. Feature: a reading of Peter Gelderloos’s article from counterpunch.org called The Pandora’s Box of Antiterrorism. The piece analyses Spain’s recent crackdown on anarchists and other dissidents under the guise of fighting terrorism. That was a reading of Peter Gelderloos’s article from counterpunch.org called The Pandora’s Box of Antiterrorism. Great writing on Spain’s recent crackdown on anarchists and other dissidents under the guise of fighting terrorism. And as Harper’s Conservatives try to pass canada’s own “patriot act” with Bill-C51, it is important to see how other Western states are treating those within “their” borders.